Author: Richard Morton and Robert Erdélyi are from the Solar WAve Theory (SWAT) group, Solar Physics and Space Plasma Research Centre (SP²RC) at The University of Sheffield. The corona is the outermost layer of the Sun’s atmosphere and is dominated by giant, magnetic structures known as coronal loops which rise up to 40,000km above the solar surface. The corona is only visible with the naked eye as a halo around the Sun during an eclipse. However, we are able to study the corona using satellites such as TRansition And Coronal Explorer (TRACE) or Solar Dynamic Observatory (SDO)/Atmospheric Imaging Assembly (AIA) which can view the corona at Extreme Ultra Violet (EUV) wavelengths (see Figure 1 for an EUV image of coronal loops). One of the most pressing (and long-standing) problems in solar physics is how the corona is heated. The temperature in the atmosphere at the surface of the Sun is around 6000 K and rises to a few million K over a relatively small distance. The coronal loops themselves can also be heated to tens of millions of degrees by an as yet unknown mechanism. The heating of the loops is part of a thermodynamical cycle which consists of heating and cooling phases. Figure 1: Image of Coronal loops at EUV temperatures, i.e. a couple of million kelvin. Image courtesy of NASA/SDO and the AIA, EVE, and HMI science teams. Because of their elastic nature, the coronal loops can support an array of magneto-hydrodynamic (MHD) oscillatory modes. One of these oscillatory modes that attracts a lot of attention is the transversal oscillation of coronal loop (referred to as the fast kink mode) which is thought to be driven externally by, e.g., eruptive solar flares. The key feature of the transverse mode is that it causes a displacement of the coronal loop axis (see Figure 2). 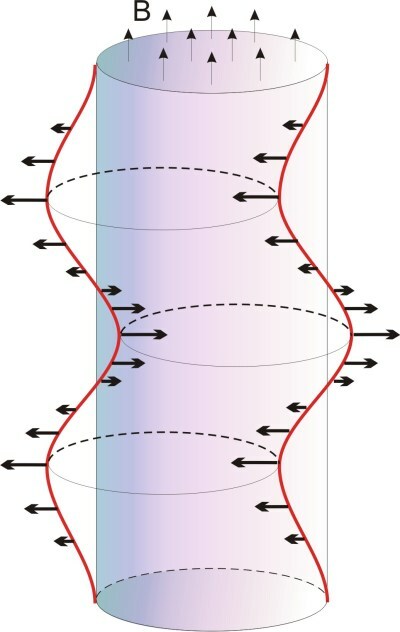 The oscillatory modes of a coronal loop are determined by the internal physical parameters of the structure (e.g., strength of magnetic field, temperature, plasma density). Observing the MHD oscillations of coronal loops provides a unique and unprecedented method for obtaining crucial information about those internal properties of the solar atmospheric plasma which are unobservable by direct means. This technique, called solar magneto-seismology (SMS) or coronal seismology when applied to the corona, is analogous to the traditional seismology of the Earth where from detecting earthquakes at the Earth’s surface, geologists derive the internal sub-crust properties of Earth. One of the observed features of the oscillations which we have to try and explain is their rapid damping, which usually occurs within four or five periods. A number of mechanisms have been proposed, e.g., resonant absorption or phase mixing, however, the search for a method(s) that can explain all observed cases still continues. Figure 2: Cartoon of the transverse mode in a magnetic cylinder. Over the lifetime of the coronal loop, the plasma is subject to a constant cycle of prolonged heating and cooling processes. A number of different mechanisms of heating have been suggested but it has, so far, proved difficult to determine if any are correct. Some of the proposed processes are wave dissipation, magnetic reconnection and nano-flares. The cooling mechanisms of the plasma are more well understood. 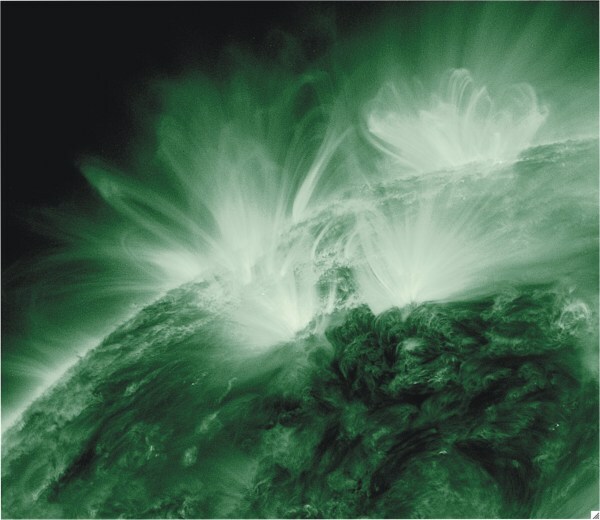 For cooler coronal loops, with temperatures less than 2 million K, radiation dominates. The cooling of the hotter loops is mainly due to thermal conduction. The loop plasma can also be subject to localised heating and cooling occurring on much shorter timescales, e.g. when the loop is flaring or close to a flaring loop. Previous models of oscillations in coronal loops have only considered a static plasma. The research we have been undertaking has taken into account the highly dynamic nature of the solar corona. In particular, we have investigated the effect of the radiative cooling of the plasma on the oscillations [1 ,2, 3]. The cooling of the plasma is found to cause a change in the frequency and damps/amplifies the amplitude of the oscillations. In Figure 3 we show an observation of a standing transverse oscillation where we provide a comparison between a static frequency and the dynamic frequency calculated from theory . It would appear that a dynamic period provides a better fit to the observations. The rate of change in frequency is also dependent on the scale height in the corona. Further to this, the cooling causes an amplification of the standing transverse mode , so it is in competition with the damping mechanism. There have been a number of reported observations of transverse oscillation where no significant damping is seen, cooling provides a natural explanation for this. Figure 3: The left panel shows observed fast kink oscillation from 4. Fast kink mode is fitted with time-independent frequency. The right panel shows the same observation but fitted with a time dependent frequency calculated from the theory. The rate of damping has also been changed to get the best fit. The corona is highly dynamic and the majority of the observed coronal loops are subject to large changes in density and temperature. The need for dynamic models of waves in coronal loops is therefore of great importance. Introduction of the dynamic background causes a number of important changes to the standing transverse oscillation of coronal loops. It has been demonstrated that the time-dependent frequency calculated from theory can provide a better fit to some of the observed oscillations than a time independent frequency  and could be exploited in future work as a SMS tool. The change in frequency can be used to provides estimates for the cooling timescale and the scale height in the corona. The transverse mode also experiences an amplification due to the cooling, so the influence of the cooling is in competition with the damping mechanism (e.g. resonant absorption). With new, high-cadence observations from SDO we should be able to see clear, undisputable signs of time-dependent frequencies in observations and the use of the new, dynamic SMS tool should be exploited. RE acknowledges M. Kéray for patient encouragement. The authors are also grateful to NSF, Hungary (OTKA, Ref. No. K67746) and the Science and Technology Facilities Council (STFC), UK for the financial support they received.